Also, me. I am logging into my character , i recive one coin ( it says i can recive 5 ) and then it doesnt show any timer, its just all i can get. Cool..
if the timer doesent show just reolg or switch char worked for me. Lol im doing it with 1 how much time did u got xD? or better to open them each day ? It doesnt matter. If you really need an ancient transform open it every day. If you want that big unboxing experience keep them for the end of the event. ATM from 6.2 launch I dont have any ancient xforms yet, after ~3-4 month i had possibility to fuse 6 large dupes and got large again. For this event Im openning contracts with 3 chars daily (from event start got maybe 2-4 large, others are normals). After fusing 6 normals (almost) every day, Im always getting.... normal again (for real, while this event is active, after fusion i never got large). Its just me so rng unlucky? yea its RNG bro, ive gotten Large and made even Ancient during this event. I have gotten 1 ancient from the coin transformation scrolls aswell. Everything is decided in the background on the RNG system. I received the Tiamat Drakan ancient after I fused 2 greens on a cleric alt account. So far i've gotten 3 tarhas (got x4 now), tiamat drakan and aquan from this event, from combining and from the contracts themselves. The post was edited 2 times, last by Rebel30 ( Jan 26th 2019, 10:07am ). 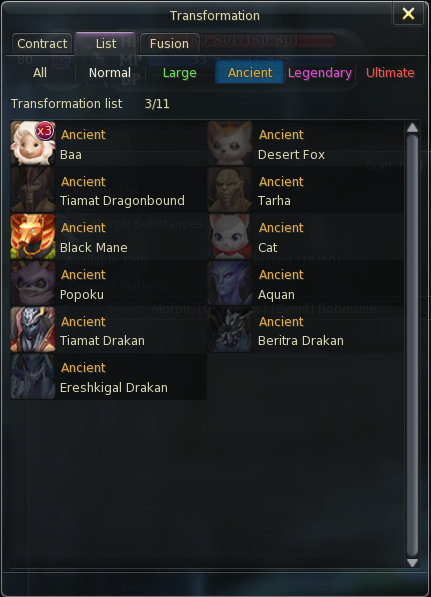 I did not get ancients , this is output from fusions of tons whites and some greens I got.